This graph from a BIS report (European bank funding and deleveraging) shows on the left for which amount in billion euro's banks of the countries in the Euro Zone have used the first 'Longer Term Refinancing Operation' 3 year loans of the European Central Bank. The second graph shows how the banks have changed their holdings of government debt in the three months after the LTRO. It seems Italy and Spain have used the LTRO money partly to buy government debt. 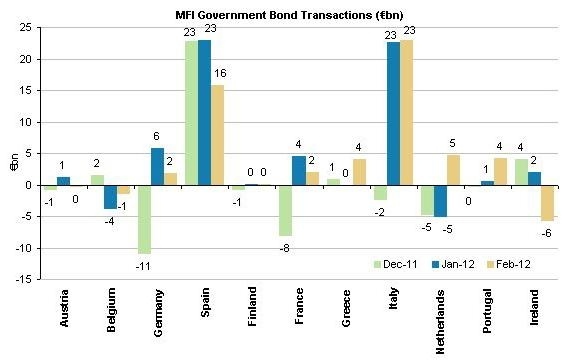 As seen by the large decrease in the interest rates of the government bonds of these two countries in the given period it is most likely the bonds that the banks bought were Spanish and Italian.